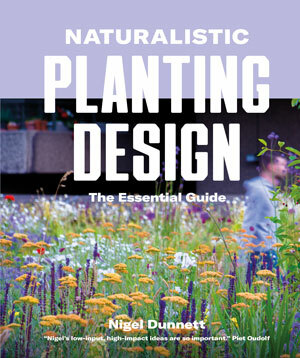 Our guest reviewer, Susie White, looks at ‘Naturalistic Planting Design‘ by Nigel Dunnett, and finds a book offering a fascinating insight and detailed guide for anyone wanting to create naturalistic plant designs. Nigel Dunnett has been creating plant-rich gardens and landscapes for decades, his work based on detailed experimental research and applying that to his designs. As Professor of Planting Design and Vegetation Technology at the University of Sheffield he has collaborated with Professor James Hitchmough on making the city more beautiful and biodiverse with natural-looking meadows, woodlands and wetlands using native but also non-native plants in their urban setting. 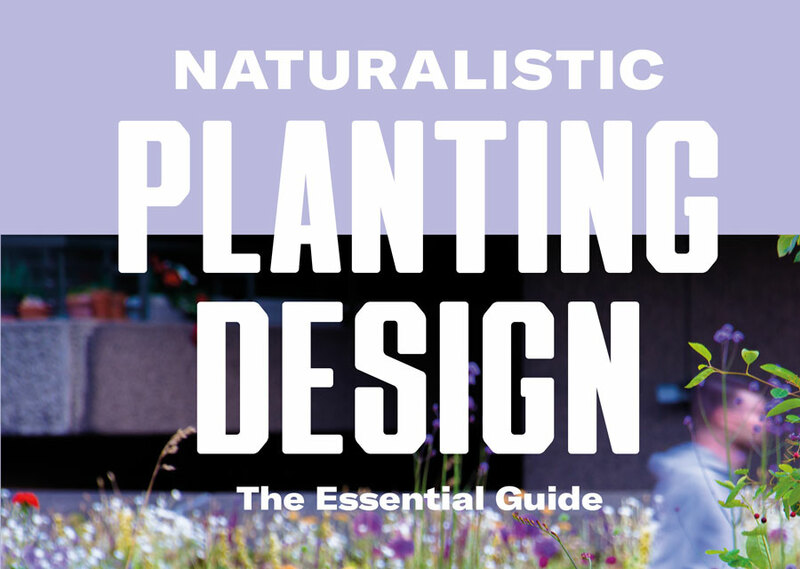 The following chapters are an analysis of the main themes of contemporary naturalism, the rules for planting design methodology, a planting design toolkit, thoughts on where design may lead in the future (rain gardens, city greening, roof gardens) along with a set of detailed cultivation and maintenance guidelines. There are case studies throughout, illustrated with clear diagrams and explanations. Nigel Dunnett says that he wants to encourage this type of planting and to make it, “mainstream rather than a niche interest” and anyone who is interested in naturalistic planting schemes will find this book invaluable. There’s a feeling of generosity of spirit, of wanting to share his love of the natural world and that feeling of being immersed in landscape, of being surrounded by beautiful planting. 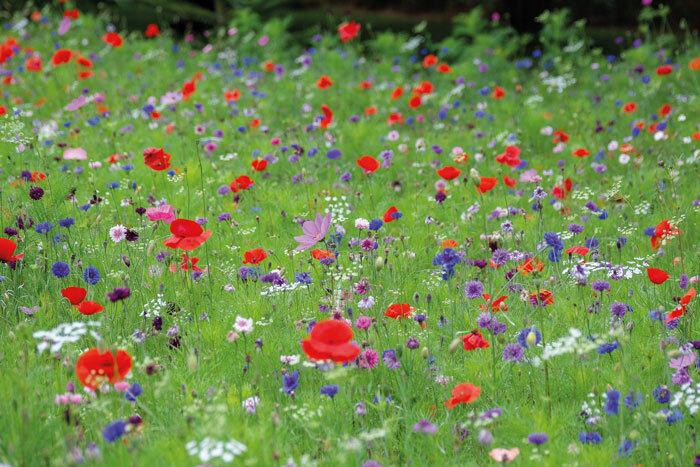 The Pictorial Meadows seed mixes that he developed along with James Hitchmough do just that and are now widely used in the places where they are most needed, in urban parks, alongside roads and in housing areas. It needs to be practical too, so his planting schemes are designed thinking of their after-care and reduced labour costs. He stresses the important of soil preparation and mulches and uses no fertiliser or manure so that the plants are self supporting. Once established they should need little weeding after early spring and winter stems are left for wildlife and for interest. He stresses the need to make spaces rather than fill spaces and large planted areas have a careful internal organisation to make them work. He incorporates ideas of environmental psychology with the human need for prospect and refuge: it can be overwhelming to be a landscape without a safe place from which to view it. Flowing schemes are not arbitrary but have carefully thought out shapes running through them: S-curves, lines of grasses, successive waves of plants rising up through the season, anchor plants with satellites and fuzzy edges between one habitat and another. 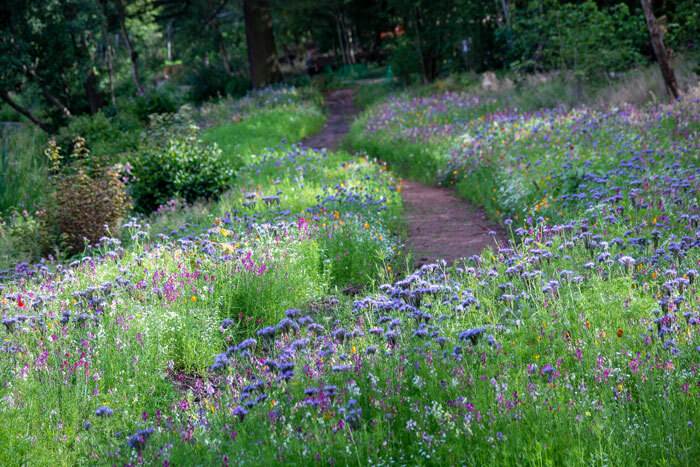 In some designs Nigel Dunnett does not work from a planting plan but uses planting mixes laid out with underlying order. The illustrations are excellent, either colourful and uplifting or adding clarity to the theory behind year long plantings. I found it especially interesting to see the series of photographs of individual planting schemes from spring to autumn, with the dramatic visual changes as plants rise up though other plants that are maturing. This important and exhilarating book is quite technical but there’s a personal thread running throughout which endears it. The authors own garden is where he demonstrates how underlying organised path and bed design can absorb the rainwater run-off from downpipes. Native and non-native plants grow tall in the ‘bioswales’ leading to the front door, soft with grasses, loosestrife and scabious. The whole book is a fascinating insight into Nigel Dunnett’s evocative ‘enhanced meadows’ and is an absolute must for anyone wanting to design in a naturalistic way. Susie White is a Guardian Country Diarist and Member of the Garden Media Guild. She is also an RHS Listed speaker.